The 'Super 8s' and the championship in general came to life last weekend. We saw brilliant games in Omagh, Newbridge and Clones as we edged towards the business end of the season. To my mind there are three bands of teams within the Super 8s, with Dublin out on their own as top dogs and showing no sign of slowing down. Behind them there is a chasing pack of Galway, Tyrone, Donegal, Monaghan and Kerry, with little between those teams. After that there is Kildare and Roscommon, who are just a little off the pace at this level. Here I rank the teams as they stand now, and suggest a player who might just bring them to a new level. 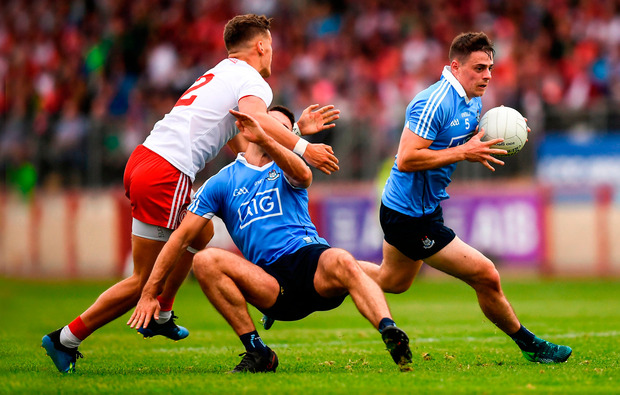 There can be no arguments that the Dubs are top of the pile and seeing them up close last Saturday night was a reminder of just how good this team is. They do the basics of the game so well. Their ability in the tackle and to close down space in key areas is second to none, while they kicked just four wides in Healy Park. What also really impressed me is that their levels of desire and hunger show no signs of waning and that's down to the management set-up. 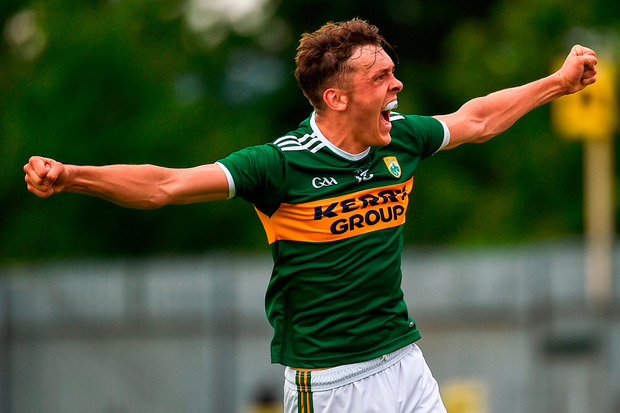 They played on Sunday like they had never won an All-Ireland, let alone going for their fourth in a row, and also continue to unearth new stars. Last year they unleashed Con O'Callaghan and this year Brian Howard is in the running for Player of the Year, such has been the quality of his performances. Transfer Target: David Clifford - If you asked Jim Gavin he'd say he has exactly what he wants. They have serious depth and quality in their panel, but I'd imagine they'd take Clifford. With Bernard Brogan injured and Diarmuid Connolly not available, Clifford, a marquee, two-footed inside-forward who can win his own ball, would add another dimension to an excellent team. Galway have really impressed me with their rate of progress this year. Save for the league final, Kevin Walsh's side haven't taken a backward step. The raw materials are there. They have a decent system and the forward talent to hurt anyone, but they just need to be a little bit more ruthless. They had goal chances they missed against Kildare, while they'll miss Paul Conroy around the middle as the championship rolls on. Galway would always have been associated with stylish and skilful players, but some might have thought they had a soft centre. There is no sign of that under Walsh. When the gun was put to their head by Roscommon and Kildare, they found a way to win. They are a very good team now, but you'll see the best of them in the next couple of seasons. Transfer Target: Brian Howard - A versatile player who can operate in defence, midfield or attack, the Raheny man would fit perfectly into the game Galway want to play. Back when they lost to Monaghan it was hard to imagine a scenario where they'd be ranked third in this list, but they have rebuilt well through the back door. If they can maintain the pace and aggression they played with against Dublin they will be close and I think that game will bring them on enormously. Last weekend also showed that Tyrone have real quality on the bench. Kieran McGeary, Mark Bradley and Rory Brennan all came on to good effect, so they have depth. There's a youthfulness about them and I think they'll improve with every outing. Transfer Target: Conor McManus - Streets ahead of the rest in terms of brain power. With the presence to put the fear of God into defenders and the ability to kick outrageous points, who wouldn't want him on their team? The Ulster champions competed with Dublin without ever really threatening. I'm surprised they didn't push on in the last 10 minutes but they seemed to be happy to sit back and take defeat, which isn't a good sign. They were five up against Roscommon at half-time last weekend, but didn't kick on then either. That could be significant because if Tyrone and Donegal draw on Sunday week it means Donegal could lose out on scoring difference. The loss of Paddy McBrearty cannot be overstated. They are a fine team with some talented players, but I don't think they can win an All-Ireland without him. Transfer Target: Brian Fenton - We saw how devastating Michael Murphy is at the edge of the square against Roscommon. If Donegal had Fenton, they could leave Murphy at full-forward permanently. 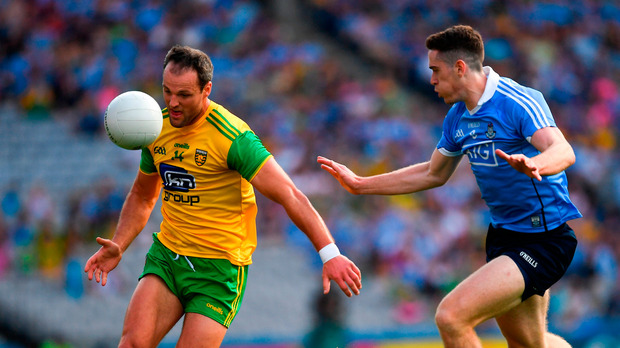 Michael Murphy of Donegal in action against Brian Fenton of Dublin. Having them behind Tyrone might look strange, seeing as Monaghan beat them in the Ulster Championship, but I think Tyrone have improved since then, while Malachy O'Rourke's side seem to struggle with some old failings. Monaghan were in a good position against Fermanagh and didn't see it home and you can say the same about the Kerry game. I actually believe there's more in Monaghan than they have shown this season. They have real quality, enough that they should be in the top two or three in the country, but they have shown that they can have a blip in each championship season where they just don't perform to their usual levels. The very best teams don't do that. Transfer Target: Michael Murphy - Game management has let Monaghan down on occasion and there's nobody better than Murphy at controlling things. I'm not sure Kerry know what game they want to play just now. I was surprised Eamonn Fitzmaurice didn't stick to his guns against Monaghan. It was as if he was reacting to calls for them to play without a sweeper and start Kieran Donaghy, rather than trusting what he was seeing every night in training. Galway are a good side and there was no disgrace in losing to them. I think they needed to win more ball against Galway and if they could do that they would have been OK. They have serious personnel and enough quality forwards to cause anyone problems, but they need a coherent style of play to progress. In terms of the All-Ireland, it might be a year or two too early for them. Transfer Target: Rory Beggan - Fitzmaurice changed goalkeepers last weekend and it's a position that has been a problem over recent seasons. Beggan's kick-outs would put them on the front foot more often and that's where they are at their best. Their hopes of progress are over and they can look back on the Galway game with a mix of pride and regret. They have some very good players, but struggled in the middle third against Monaghan and that is the area they need to improve. After an up and down season they seem to be moving in the right direction. Transfer Target: Ciarán Kilkenny - Kildare have the physicality and are a team on the up and with Neil and Daniel Flynn they have two potential stars in their ranks. A general on the 40 to orchestrate, control, set up and score is what they require and there's no one better in this regard than Kilkenny. Of all these sides, Roscommon are the ones who might struggle to get back to this stage next year and I also think they might have a new management in place. Kevin McStay has put in a huge amount of work, but they have lacked leadership on the pitch and that was evident against Tyrone, when they appeared to throw in the towel. They have quality forwards but have struggled at the back. Imposing full-forwards like Andrew Murnin, Richie Donnelly and Michael Murphy all had good games against them. Transfer Target: Jonny Cooper - Teams have had plenty of success against them by putting strong men on the edge of the square. A strong, dogged figure like Cooper would have tightened their defence.